There are iconic moments in my life as an artist, few of which are derived from my own art practice, and instead have come more from looking at art. As is no doubt the case for many who consider themselves a part of the art world, Bruce Nauman figures into the mindscape. He has a place in my brain because of his Setting a Good Corner (Allegory & Metaphor). 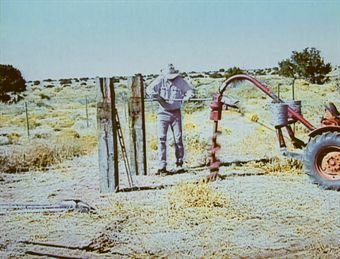 The piece shows Nauman building the part of a fence to which a gate will be affixed, a crucial, and perhaps the most demanding aspect of such construction. When I first saw this video, I was contemplating a move to the country and wondering how this change might affect me as an artist, and hence, change my work. Familiar with the type of labor portrayed in Setting, I knew its purpose and import. I did not question the validity of the video as art as I could make the easy leap to the larger picture. What bothered me was the corral-like parenthetical in the title. Why the need to reach out to plea, to guide or even over-explain? It suggested that Nauman, despite years of success, had doubts, not about his work, but how best to give his audience access. Two other iconic moments in my art-viewing life happened in one day, in fact, back-to-back. It was the late nineties and I was visiting an MFA program during its mid-term critiques. One student had a single painting to show for several weeks in his studio. It was a small painting of a portion of his studio. The only thing that saved the forty-five minutes was when someone floated the very nineties idea that we were actually witnessing a performance, a parody of some sort. All well and good, except for the hackneyed aspect of such a notion or the actual execution. But it wasnt too far off the mark. As the critique progressed, we came to learn that another student had painted the picture for the presenter. Now we had a piece to discuss! True story. Or close to true. I may have restructured the memory to better suit my taste and needs: an icon. There may have in fact been three crits back-to-back, two of which I have blended into one: a student who made a painting of his studio, and another who had others paint his paintings for him, for I remember both things occurring. Which still leaves the question, why the studio? A superior irony? No, not really, at least not until the other (second or third) crit when a student from another department (he had made special arrangements to be critiqued by the fine art faculty) upped the ante and presented a calendar he had made, complete with special days marked for specific memories throughout the year and pictures of himself as the artwork for each month. It would seem that I have strayed from Nauman; but hold onto the idea of what an artist does when left to solitary devices, for this is where we often find ourselves and what we share with Nauman, and it is in these earliest works of his where this is made clear. And, as with Setting a Good Corner, I was, metaphorically speaking, at home. Nevermind that the title for this exhibition is Basements and my studio is in my basement, or that these pieces contain what become ritualized activities and that I burn incense while I work. No, these similarities are too simplistic. I felt I knew his mind, meaning that there is a point in the very early stages of a creative process where one says to oneself, Do anything. Build from there. Busy, busy, busy are these pieces; but merely busy work made into art? No, they are purposeful, even if the points of some are elusive. In Flesh to White to Black to Flesh, Nauman applies white stage makeup to his head, torso, arms and hands, then puts black makeup on top of that, and ends up wiping it all off. In Wall-Floor Positions, he establishes the boundary of his movements/poses within the place where the two parts of the structure meet while also keeping somewhat in frame of the camera, often punctuating a transition with a slap or clap. 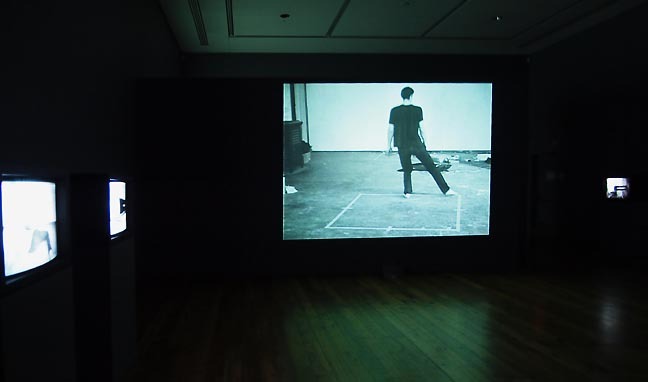 Dance or Exercise on the Perimeter of a Square (Square Dance) shows Nauman making sidesteps around a taped-off square on the floor, pacing himself to what may have been a metronome. Bouncing in the Corner No. 1 shows Nauman falling back into a corner with a thump, sometimes with his arms outstretched to slap against the walls. The other pieces in the exhibit add to the music as they portray what their titles describe: Bouncing Two Balls between the Floor and Ceiling with Changing Rhythms; Violin Tuned D.E.A.D. : and, Violin Film #1 (Playing the Violin as Fast as I Can). 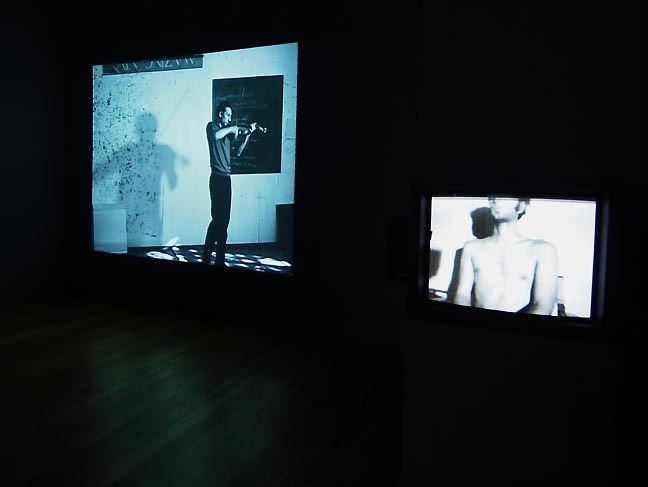 Although varied in length, some of these pieces continue for an hour, and to watch them in their entirety would begin to approach the time required for Naumans Mapping the Studio (Fat Chance John Cage), a video from 2000  and not unlike this group  in which he documents the goings-on of mice and his cat in his studio at night. I might be forgiven for not spending the day, yet when I was about to leave, I passed by Flesh again to see Nauman sitting there in blackface, rolling his eyes around, rubbing his hands together, looking at his fingernails. He was dawdling, hamming, waiting for some arbitrary moment to return to his normal flesh tone. This relative inactivity, less dramatic or frenetic than anything on the other monitors or in projections, held my attention and somehow felt key to everything else in the room. It was the time of What next? for both the artist and the viewer, waiting for something to which we could attribute some purpose, no matter how seemingly absent of import it may be. And from here we traverse though the years that follow, not only in Naumans career, but for those he has influenced, whether they knew it or not, and for the latter, though many hardly matter at all. When I returned home and determined I wanted to write about this show, I knew I would want to see the videos again to make sure my observations were accurate. It was doubtful that I would be able to return to Cooley Gallery, so I went to YouTube and typed in Bruce Nauman. The third video listed was Hennessey Youngmans bit on how Nauman owned a number of art materials and subject matters. Youngmans advice to young artists influenced by Naumans work or wanting to work in a similar vein was they should just forget about it. However, upon further perusal of videos, it was clear many had not heeded this advice, for there were many, many more videos tagged as an explicit homage to Nauman  some even restaging his work and not an insignificant number of these artists were applying stage make-up for the camera. These folks might have been better off having never been exposed to Nauman in the first place. Or Duchamp, or Warhol, or Beuys, or Picasso. You get my drift. Not that we should not take note of other artists who provide inspiration. (Nor should we use them as a measurement to determine how well we stack up.) Nauman is one of those contemporary artists who light the way by showing us what is possible outside of the restrictions we may unnecessarily impose on ourselves. Through his work he becomes the unintentional/reluctant instructor/purveyer of how to open up to that place in our mind from where ideas spring. Alone in the studio with only our materials and imagination, the question persists: What next? Think small; then do: so rudimentary yet so hugely liberating, this purpose for no practical reason. Yet, for some the problem seems to be assuming that if someone like Nauman can do almost nothing and call it art, then something that more closely resembles absolutely nothing relevant for an audience is even more radical. It is a mistake to be so easily contented or less discriminating as to settle for the uncongealed inspiration as ones art; yet the trick is to recognize this mistake. Still, Nauman is keenly aware of a need for structure as an accompaniment, hence the camera placed on its side or upside down, or, in later work, the use of parenthetical enhancements to titles. This is what makes his works significant. To think that many of these early Nauman pieces are idle thoughts manifested into actions fails to recognize a difference between minimal gestures within a given form and the more commonplace art that comes out of narcissism, self-indulgence or unacknowledged sense of entitlement, the latter all suitably designed with an efficacy for an audience of one. THE DOUGLAS F. COOLEY MEMORIAL ART GALLERY | REED COLLEGE 3203 SE WOODSTOCK BLVD. A lot o people whose opinions are worth listening to feel like Basements is the best show they have ever seen at Reed and I'm inclined to agree. Perhaps it is the fact that this is a collection of some of Nauman's earliest fully realized works all together in one room... a cacophonous but slick presentation comprised of some rather charmingly bare bones even tough works. The effect is a bit like Led Zeppelin’s BBC sessions, it's all there in such an fresh and intimate setting but we all know how influential it becomes. It is all a bit like watching super 8 films of Steve Jobs and the Woz making the first Apple Computer in a garage in a museum. To the musician in me (which Nauman is a well) they feel like a series of rudiments or exercises and it wouldn't surprise me at all if he had practiced these numerous times before recording them. These aren't simply performances, it is kinesthetic source code and it is open source at that. Overall, it is all there, the sense of constant impersonal interrogation, panopticon surveillance, rigor and systematic curiosity. Like a lot of his earlier works he is the subject and once he gets his chops together things like Clown Torture come much later.